Fr. Josef Jungmann, as we have seen, floated the idea that the Council of Trent’s definition of the Mass as the Sacrifice of Calvary was a distortion of the truth, brought about by its “exaggerated” preoccupation with combating the attacks of 16th century Protestantism. In his opinion, if we want to find the true meaning of the Mass, we must not look to Trent and subsequent catechisms because they were too “narrow” and “one-sided” in their definitions. 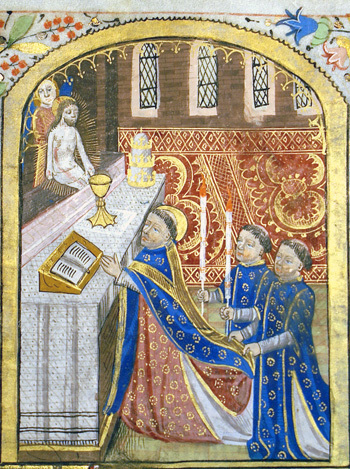 He complained, for example, that they “insist on the fact that on our altars Christ renews His Passion and Death in an unbloody manner”; they “talk about the renewal of the sacrifice of the Cross, about an oblation in which Christ gives himself to His heavenly Father”; they are too concerned about the Christ’s “presence in the sacred Host” (1) and care nothing for the people. But, as the essence of a thing is that which gives it its identity and determines its fundamental nature, it follows that the Mass must have something unique and specific by which we can “absolutely and exclusively” identify it. And this identity, according to the clear and explicit doctrine of the Church, is the Holy Sacrifice. 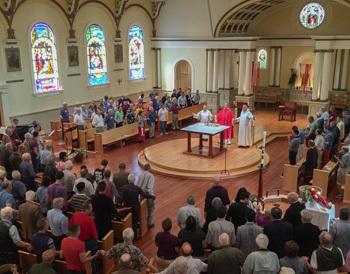 Jungmann introduced ambiguity into the meaning of the Mass by presenting it under a patchwork of identities: a thanksgiving ceremony, a memorial that recalls past events, a holy meal shared by all, a gathering of the faithful, a community experience and an oblation made collectively by the Church. (5) But in this kaleidoscope, Christ’s sacrifice of himself is placed in the background. Yet this fallacy is found in Article 47 of the Council’s Liturgy Constitution (1963), the relevant section of which was written under Jungmann’s direction. (7) It is evident from this description of the Mass that its essence as the Holy Sacrifice is fragmented into multiple identities and rendered meaningless to the Catholic mind. Jungmann’s adverse influence on the modern perception of the Mass is ongoing. Ever since Vatican II, the terms Mass, Lord’s Supper, Eucharist and Eucharistic Celebration are used interchangeably, even in official documents. Basing itself on Article 47 of the Liturgy Constitution, the so-called Catechism of the Catholic Church, in the section headed The Paschal Banquet, defines the Mass as a memorial, a sacred banquet and a Communion service all rolled into one. (10) No one in official circles seems to be able to mention the Mass without also qualifying it as a banquet. With such a confused presentation, one could hardly expect anyone – priests or lay people – to know what the Mass really is. Here, St. Thomas Aquinas’s reference to the Sacred Banquet is misrepresented. O Sacrum Convivium (O Sacred Banquet) was the Antiphon that he composed for the Office and Mass of Corpus Christi. It was unmistakably clear to the pre-Vatican II faithful that the Sacred Banquet referred to the Blessed Sacrament, not the Mass itself, so that no one would have been in danger of regarding the Mass as a Communion service. The Catechism’s “explanation” seems not so much an instruction in the Faith as indoctrination into the underlying ideas of the Liturgical Movement. In January of 1943, Jungmann participated, together with Rahner and Guardini, at a symposium in Vienna about the liturgy of the Mass. 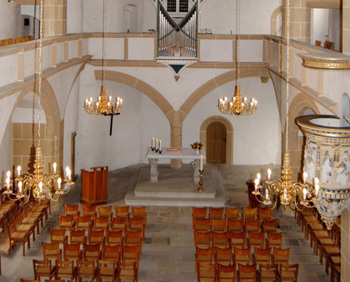 The purpose of the gathering was to gang up, as it were, against Archbishop Conrad Gröber of Freiburg, a member of the German Bishops’ Conference, who had complained about the attempts of the liturgical reformers to “Protestanize” the Mass. The Archbishop had recently circulated a Memorandum consisting of 17 criticisms, one of which concerned the error of presenting the Mass as a meal. But nothing could be more calculated to diminish the concept of the Mass as an act of worship than to give greater emphasis to the idea of a meal that is associated in everyone’s mind with a purely human, social activity. It does not take a great deal of perception to notice how, chiefly under Jungmann’s influence, the “community meal” dominated the creation of the Novus Ordo and how virtually all prayers pertaining to the Holy Sacrifice in the traditional Mass came to be seen as disposable. As a result, the texts, rubrics and architectural features of the Novus Ordo ensured that the Sacrifice of the Cross faded into the background. It was replaced by spurious “table prayers” recited over things to eat and drink. In this way, attention was deliberately deflected away from the miracle of what the bread and wine were about to become, and on to the people – their gifts, their offering, their munificence, their procession, their “rights” to act and be heard. In the next section, we will look at how Jungmann brought the “community experience” to new heights when he invented the first “mega-Mass” in 1960. Josef Jungmann, Mass of the Roman Rite, vol. 1, p. 180. These thoughts are expanded in its note 10: “This is true not only of German-language catechisms, which are satisfied with a statement that “Jesus Christ offers himself in holy Mass”; the New Baltimore is equally vague (“Christ gives us His own Body and Blood ... to be offered ...” q. 356) and equally one-sided (“The Mass is the sacrifice of the New Law in which Christ, through the ministry of the priest, offers himself to God in an unbloody manner under the appearances of bread and wine.” q. 357). Jungmann quoted as his source the work of a prominent member of the Liturgical Movement, G. Ellard, S.J., ‘Mediator Dei and Catechism Revision,’ The American Ecclesiastical Review, CXX, April 1949, pp. 289-309. But in this article, Ellard stated that the Baltimore Catechism should be modified to accommodate the new thinking on the Mass promoted by the Liturgical Movement. J. Jungmann, Mass of the Roman Rite, vol. 1, p. 176. Pius XII, Encyclical Mediator Dei, November 20, 1947, §114. According to Joseph Ratzinger, “The Mass is not only a meal among friends who have come together to remember the Lord’s Last Supper through the common breaking of bread. The Mass is the common sacrifice of the Church, in which the Lord prays with us and for us and communicates himself to us”. The Ratzinger Report: An Exclusive Interview on the State of the Church, Ignatius Press, 1987, p. 132. Jungmann, Mass of the Roman Rite , vol. 1, pp. 175-179. This section is headed “The Meaning of the Mass”. Congregation for Divine Worship, General Instruction of the Roman Missal,(GIRM), 6 April 1969, § 7. The same document also stated that “the Last Supper is made present” in the Mass (§§ 48, 55). Although these grave theological errors were brought more into conformity with Catholic doctrine in the revised version of the GIRM in 1970, no corresponding changes were made to the New Mass itself. Neither is any recognition given, in any part of the revised document to Pius XII’s teaching in Mediator Dei (§ 91) that Christ is made present on the altar by the priest alone acting in the name of Christ, and not as the representative of the faithful. Even in the 3rd typical edition (2003, English version), there are references to “the celebration of the Mass, that is, the Lord’s Supper” (§§ 17, 27). The conclusion is inescapable that these errors and deficiencies found in the original GIRM constitute the true principles of the Novus Ordo as intended by its framers (principally Jungmann), and reveal its true nature. Cardinals Ottaviani and Bacci, Critical Study of the Novus Ordo Missae, September 25, 1969. J.A. Jungmann, ‘Zu liturgischen Fragen im Freiburger Memorandum’ (On Liturgical Questions in the Freiburg Memorandum), 1944, in Theodor Maas-Ewerd, Die Krise der Liturgischen Bewegung in Deutschland und Österreich, (The Crisis of the Liturgical Movement in Germany and Austria), Regensburg 1981, p. 612. Maas-Ewerd gives various sources of information on the Vienna symposium. J. Jungmann, The Mass of the Roman Rite, vol. 1, pp. 191, 178, 179. Here he referenced the work of Romano Guardini, who had elaborated his own theory that the basic structure (Grundgestalt) – which he equated with the essence of the Mass – was the Lord’s Supper. See R. Guardini, Besinnung vor der Feier der heiligen Messe (Meditations before Mass), Mainz, 1939, pp. 72-76. Romano Guardini had nothing but contempt for the traditional Offertory. “What sacrifice it contains” he stated, “is of a very simple nature: formerly the faithful brought gifts so that from them the sacred meal might be prepared and the poor fed. This sacrifice consists, then, in the generosity and charity with which the congregation contributes to the holy service of the altar and to their neighbors.” R. Guardini, Meditations Before Mass, Westminster, MD: Newman Press, 1956, Chapter 6, note 5.